1st May and my CanSaveCarbon challenge is completed. Not only did I extend my original target from 2,000 to 3,000 discarded drinks cans, but then again to 3,620, reaching that target yesterday – sad evidence of the litter problem in Gwynedd. Recycling all these cans has saved over half a tonne of CO2. Thank you to everyone who has donated or sponsored me. All the sponsorship pledges are in and donations now total £1,408. All proceeds to the Snowdonia Society’s work. in cash at the Snowdonia Society office. 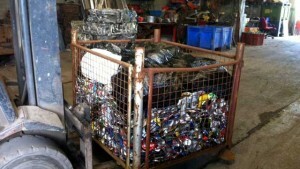 The 3,620 aluminium cans have been sold to a scrap metal merchant for recycling. The final weight was 61kg, 6kg more than anticipated which at 30p/kg, generated £18.30 towards the cause. 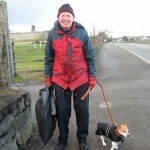 During my challenge I was very heartened to meet so many other people who also pick up litter, some openly, like Geoffrey from Bontnewydd, and many others preferring not to promote what they are doing. In addition several people have told me they have started picking up discarded drinks cans, in particular! Do we need deposits on drinks containers? If you know anyone who might be inspired by this effort, please share this page. Or why not do the the same in your own area, or adopt a patch to keep litter free? Join one of the Snowdonia Society’s litter-picking days. If you are concerned about marine plastic litter, take the Marine Conservation Society’s June Plastic Challenge. Finally, how do we help change the litter dropping habit?